The concert will hold on Monday April 30th at Eko Hotel & Suites, VI. Tuesday May 1st is public holiday (May Day) so y'all can make it. Regular ticket: N5, 000. Premium regular: N10, 000. 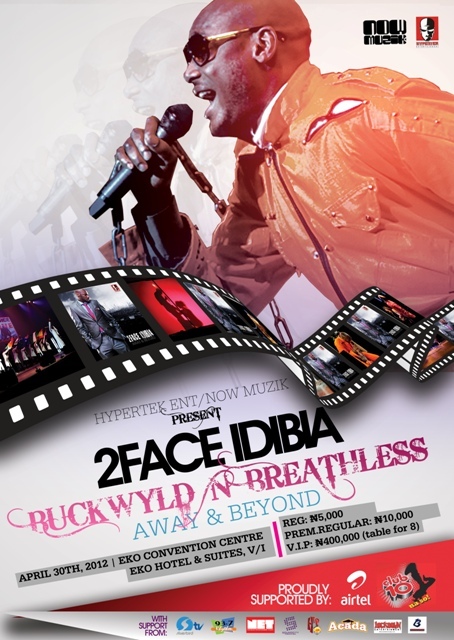 VIP N400, 000 (Table for 8). I'm giving out TEN tickets here. 5 regulars and 5 premium regulars. To win, tell us the year 2face Idibia's former group, Plantashun Boiz released their first album. First ten people with the correct answers get the ticket. Goodluck! Their First Album was released in the year 2000. Body and Soul was released by the defunct pop group in April, 2000. Platashun boys released their debut album Body & Soul in year 2000. It's like every week there's one concert or another thing happening in Lagos...na real wah for una o....what time then do pple really spend to work hard and become better...no wonder many are living in DREAM LAND. Anytime, I show face for blog, if no be concert, na award, or red carpet show...Too much of everything get as e be shaa....Naija pple una don do am so tey una overtake America...overtake don finally overtake overtake! na just my opinion....if u like swear for me, NA BACK TO SENDER OZUGBO OZUGBO. They formed the Group 1997 and they released their first album year 2000. Plantashun Boiz released their debut album “Body and Soul” on Dove Records in 2000. Plantasion boiz released their first album in year 2010 titled body and soul. Oya linda where is my ticket?? It was year 2000 with the title "body & soul"
My name is Okorie Chukwudi. their first album body and soul was released in 2000....holla at me @princeakad for my ticket! Body & Soul & was released in the year 2000. The Answer is - Body and Soul - which was put out in the Market in the year 2000.
it was in 1996, i could remember vividly. Year 2000. the album name is "Body and Soul"
Oh now, Easy answer, the answer will be - Body & Soul -, this was out year 2000.
plantashun boyz released their 1st album in the year 2000. Plantatiob Boiz 1st album was released in 2000. Their first album was released in the year 1999.
i think its 2000. lol i want to win ohh. can i comment ten times win all, i joke. Its Body and soul-yr 2000. Emeka ordu, and May 1st that's my birthday. Plantashun Boiz released their first album in year 2000 under dove records. 1999 is the answer to your question and am the first to comment. 400000 for table, say wetin happen... for Beyonce sef, wey go do all thee acrobatics and bring amazing dancers to the stage , no charge pass 60 pounds..
the first album by plantation boyz was in 2007.
it was released in 2000 titled BODY AND SOUL. PLANTASHUN BOIZ RELEASE THEIR FIRST ALBUM IN THE YEAR 2000. 2000 " Body and Soul"